While love of the game is a good start if you want to become a golf instructor, you may need more than that to make a career of it. You don’t necessarily need golf instruction courses to be giving lessons, but certification will certainly help. But with so many certifying bodies, and different levels of certification you can achieve, it takes some research to figure out which golf instructor certification is right for you. As a golf lover, giving golf lessons can be a very fulfilling career choice. You can also make a decent living doing it. And while you can likely find private customers without any sort of certification, you will greatly expand your opportunities if you go ahead and get certified. Most golf courses, for example, will require at least some form of certification to hire you. And if you have really high aspiration of making it only the professional circuit, then you’ll definitely need to invest in strong certification. So where should you begin? If you have the time and the resources, you can get a Bachelor’s degree in what’s called Golf Management. This is a great long-term investment both in your golf instruction skills as well as a terrific background for learning how to manage your golf pro business. Many of these programs also include an internship, so you can be assured you’ll get some hands-on practice as a golf coach. There are also all sorts of certification programs and classes offered by the private sector. Some are better than others. And it takes some research to find which are most accepted and respected in your area. Just make sure, in addition to teaching you how to become a golf coach, reputable courses should also cover a bit of anatomy, nutrition, psychology, and biomechanics. Because in addition to actual golf skills – grip, swing, and stance – a good golf coach takes a holistic approach to the game. This includes helping with strategy, physical well-being and mental stamina. If you’re really serious about being a golf teaching pro, certification from the Professional Golfers Association (PGA) is a great next step to take. What you’ll actually be certified as, is a professional golfer – something you can really leverage to upgrade your golf coaching career. Keep in mind, as this is considered by many the ultimate level of golf certification, it’s a serious process. Be prepared to invest time, effort, and money in this pursuit. Equipment – To get started you’ll certainly need your own clubs, and maybe some spares, plenty of golf balls, excellent cleats, and a good carry bag. Customers – It will take time to build a customer base. Think of where you want to work; with high school students, at the local country club, college level sport? 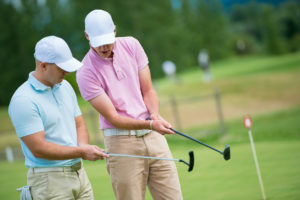 Golf instructor’s insurance coverage – As golf is a physical sport, you’ll need liability insurance to keep your customers covered. Also, many golf courses and putting grounds will require you to carry insurance in order to use their facilities. Drive – Once you’ve gotten certified as a golf teaching professional, the game’s just begun. You need to stay fit, keep up with developments in the sport, and continue improving your own game.